EBI has unrivalled information management and analytics expertise. Since founding EBI in 2001 our mission has been to give high growth, enterprise and global business clients a significant competitive advantage from their information management and analytics solutions. A platform tailored exactly to organisation needs and strategy, which achieves return on investment, fast. We achieve transformational results across all market sectors from financial to FMCG and every business function from procurement and logistics to marketing. At EBI we put information management at the heart of every solution. Combining and formatting all available data in the perfect way to deliver business needs, solve problems and exploit opportunities. With the correct information management in place, a combination of off-the-shelf and bespoke analytics technology unlocks knowledge and insight that reliably gives clients the edge. Streamlining operations, saving time and money, making fast, informed decisions and delivering fresh insight to reach and engage with customers. Independently owned, EBI are one of the UK’s leading, most experienced consultancies operating in this field. We have unrivalled business and technical expertise, employ the best consultants and have built a reputation for achieving significant and sustainable business value for our clients. EBI deliver highly effective end-to-end solutions. We also often take over and accelerate existing projects that are stalling or falling behind schedule. This has become something of an EBI specialty. A unique EBI project methodology underpins our approach. Developed and refined for over a decade this enables us to divide even the most complex project into manageable and deliverable work streams. Which means EBI always deliver on time, on budget and beyond client expectations. We call our methodology the ‘EBI Blueprint’. 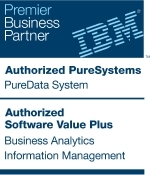 Based on our expertise and best practice standards EBI are a certified IBM Premier Business Partner. We are agile, headquartered in the UK and have a proven track record of delivery. Please get in touch to find out how we can deliver the EBI Advantage for you. “What has been interesting is seeing the EBI Blueprint in action in real terms in our organisation, and it has delivered a quality result. I think where the extra mile has been needed, those guys have been more than happy to do that." "EBI are a highly skilled team of individuals who have a varied skill set. They are always very professional in both their dealings with AB InBev and any of our 3rd party partners. EBI bring to AB InBev an approach that is looking to the long term relationship and therefore with their strong business and commercial knowledge are able to add a great deal of value."